← Relative Cost of Reloading – So Why Bother? The die was unscrewed from the press and screwed back in upside down for the remainder of the operation as well as to show the stuck case. Note the missing section of rim at 10:00 o’clock! And the bent section at 5:00. Oh Poo! you’re pulling down on the press lever and nothing on God’s Green Earth will allow that case to budge. You go gorilla on it, and you finally you succeed in ripping off part of the rim. But the case is firmly and irrevocably stuck in your resizing die. Fear not, help is on the way, the Stuck Case Removal Kit! I have found that it’s easier to unscrew the die and screw it back into the press upside down for the next part of the operation, namely drilling out the primer pocket. The Stuck Case Removal Kit comes with a drill bit, a tap, a bolt, and a cup, all of which are used in this process. So, first we drill out the case primer pocket as shown. Be careful in this step not to bugger up your dies with excessive enthusiasm or rushing. Use the supplied drill bit to drill out the primer pocket. Next, using the supplied tap, tap the hole left by the drill. Use the included tap to tap the drilled hole where the primer pocket used to be. Run the tap in and out of the hole a couple of times to make sure the threads are clear of brass shavings. It should look something like this when you are done. After tapping the primer hole should look nicely threaded without too much debris. 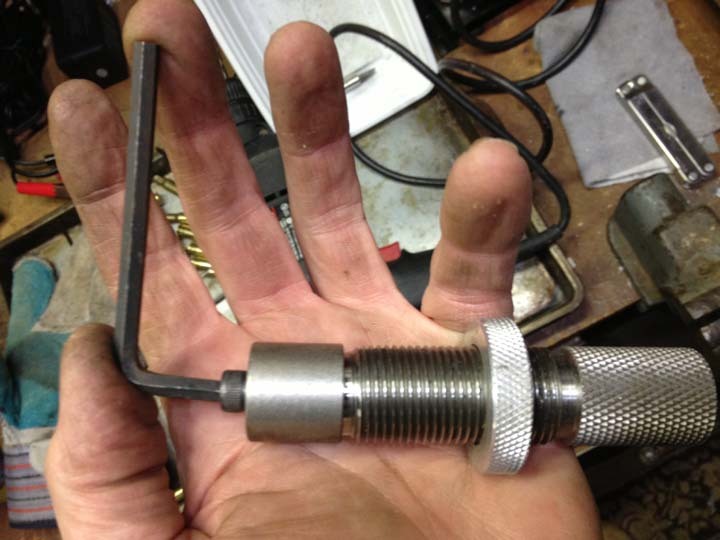 Next you will place the threaded bolt through the closed end of the cup and thread it into the now threaded case base. 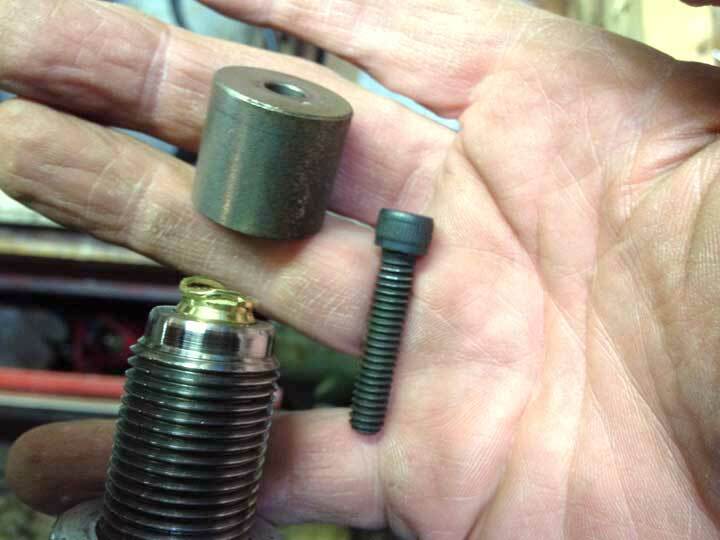 The Die with the stuck case, the threaded bolt and cup of the Stuck Case Removal Kit. This process can definitely be done either in the vise or in the press, I show it here, hand held, for the sake of easy viewing. Screw the bolt down making the bolt and cup snug against the base of the die. Take up the slack threading the bolt until the cup rests against the base of the die. 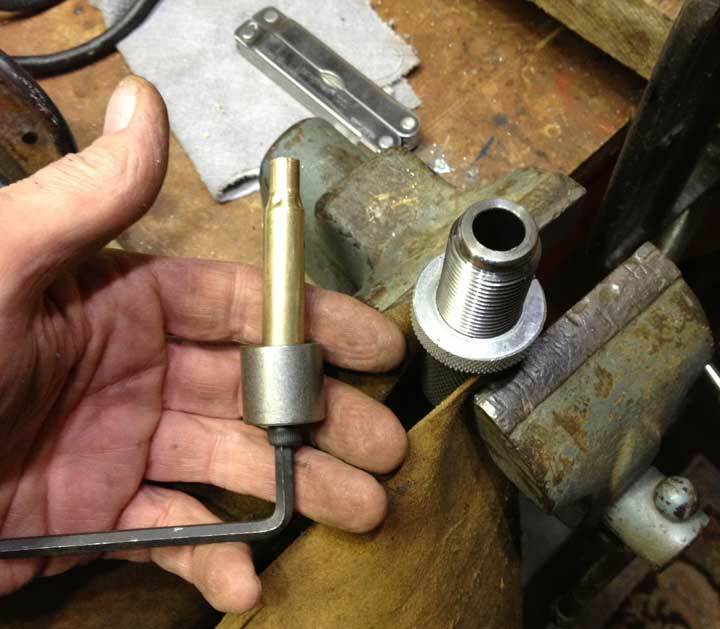 Then secure the die in a vise using leather or wood to protect the threads of the die. Be careful not to over tighten the vise. Make it just tight enough to prevent the die from turning as you torque down on the threaded bolt pulling the stuck case from the die. If all goes well, and you follow the directions, your case will lift itself free of the die. Patience and a lack of rancor will aid this process immeasurably.